Pork is sometimes referred to as the “other white meat”, but comparing this meat to others takes away from its unique flavor. Ham, bacon, and sausage are just a few of the many delicious food products that can be made from pork – the same cannot be said for chicken! If you want to bring out the natural flavor of your favorite cuts of pork, season them with Bolner’s Fiesta Brand Pork Rub before cooking. Simply rub a generous portion of the seasoning blend into your favorite cuts of pork and let rest for 30 minutes (or refrigerate overnight) before cooking. To maximize the flavor, use thick cuts of pork and sear them over high heat then reduce the temperature and cook slowly until the internal temperature reaches 170°F. 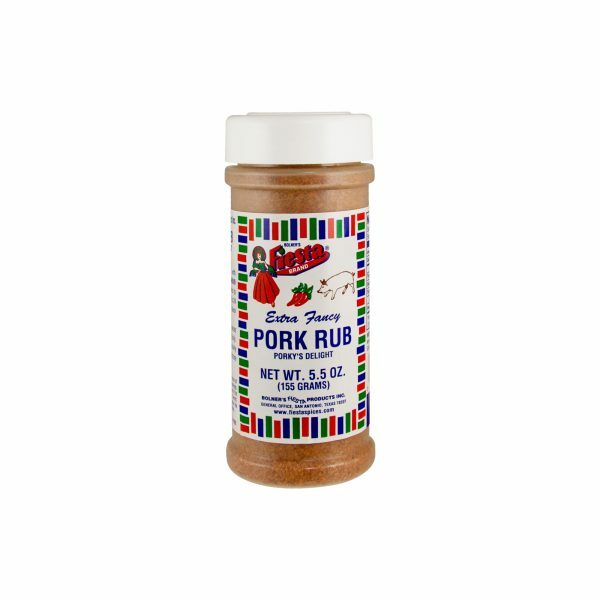 Rub pork generously with Bolner’s Fiesta Brand® Pork Rub 30 minutes prior to cooking or refrigerate up to 24 hours for maximum flavor development. Flavor hint: Sear large pieces of pork over hot fire quickly. Reduce heat and cook slowly until done (Internal temperature of 170 degrees F). Salt, Sugar, Brown Sugar, Spices, Monosodium Glutamate, Paprika, Chili Peppers, Garlic, Onion, and Silicon Dioxide (Free Flow Agent). Amounts per Serving: Calories 0g; Total Fat 0g (0%DV*); Sodium: 140mg (6%DV); Total Carb 0g (0%DV), Protein 0g. *Percent Daily Values (DV) are based on a 2,000 Calorie Diet. Mix all ingredients together, pour marinade over meat and refrigerate overnight turning once. Place bacon strips on meat and barbecue or bake over moderate heat until done (geese, roasts 3-4 hours, backstrap 45 minutes). For smaller pieces (steaks, doves, quail, etc. 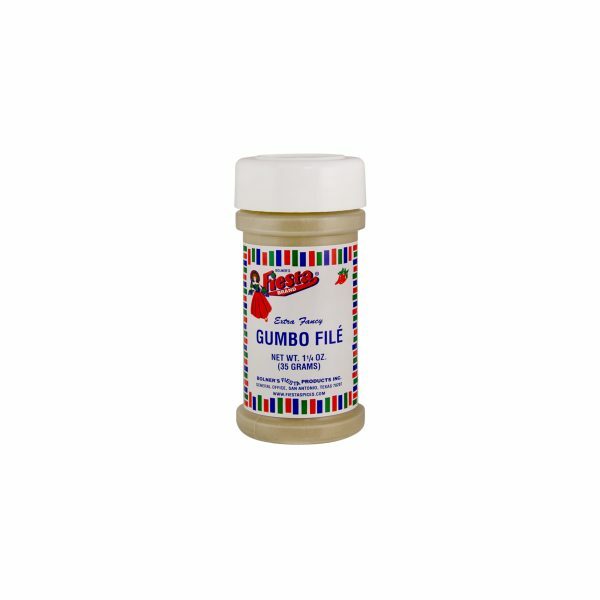 ), sprinkle Bolner's Fiesta Brand® Wild Game Rub on game at least two hours before cooking ( overnight is best). Barbecue, bake, braise or fry as preferred. Chopped onions, tomato, lettuce and picante sauce for garnish. Heat the oil in a skillet and brown the meat. Add the water and the seasoning and simmer the meat on low heat until done( 20-30 minutes). Fill the taco shells with meat and garnish. Enjoy! Our Aunt Bev Loves her black beans. She suggests 1 lb. Black Beans, 1-14 oz. can whole tomatoes, 8 Tbls. Bolner’s Fiesta Brand® Black Bean Ole' Seasoning, 1 1/2 quarts water, and 1 lb. ham chunks or sausage. Rinse beans and cover with water and tomatoes. Cover and bring to a boil. Reduce heat and simmer 2-3 hours or until tender adding hot water when needed. Add 8 tablespoons Bolner’s Fiesta Brand® Black Bean Ole' Seasoning, ham or sausage if you desire it and simmer another 30 minutes. Garnish with sour cream, pico-de-gallo and Monterey Jack Cheese. Black Bean Ole' may be prepared ahead and frozen. Serve as an entree or as a side dish with Fajitas, Mexican Rice or puree for chalups, crispy tacos or Mexican style layer dip. Heat cast iron skillet until extremely hot (minimum 10 min.). In a separate pan, melt 2 Tbsp. butter per 8 oz. Filet. Dip filets in butter, and then coat both sides with River Road Blackened Seasoning. Cook each side until it appears to be charred (1 ½ - 2 min.). Saute 1/4 onion in butter until clear. Allow to cool. Mix 2 tablespoons seasoning with 1 lb. fresh ground beef and sauteed onions. Form patties of the desired size and grill to a medium-well temperature, topping with blue cheese crumbles just before the meat is done to allow a slight melt. Place patty on a toasted sesame seed bun, topped with your favorite condiments, onions, lettuce, tomato and pickles. Quick Chipotle Burger: Sprinkle liberally on patties before grilling. Serves 6-8 1 tbsp. vegetable oil 2 lb. chili meat or ground beef 4 cloves fresh garlic (peeled and chopped) or 1 Tb Bolner’s Fiesta Brand® Chopped Garlic in Oil 1 medium onion (chopped) or 2 tbsp. Bolner’s Fiesta Brand® Instant Chopped Onion 1-15 oz. can Tomato Sauce 1 quart chicken broth ½ tsp. Monosodium Glutamate (optional) ½ tsp. Salt (Optional) 5 tbsp. vegetable oil 4 tbsp. flour 4 tbsp. Bolner’s Fiesta Brand® Fancy Light Chili Powder ½ tsp. Bolner’s Fiesta Brand® Whole or Ground Comino ½ tsp Bolner’s Fiesta Brand® Ground Black Pepper Slowly brown the meat, garlic and onions in 1 tbsp. vegetable oil. Add the tomato sauce, chicken broth, monosodium glutamate and salt. SIMMER one hour. Heat the 5 tbsp. vegetable oil in a sauce pan over medium low heat. Fry the flour, pepper, comino, and chili powder for 5 minutes, then add this roux to the meat. Be careful not to burn the flour. SIMMER over low heat for ½ hour. Serve in bowls with hot tortillas. Chili is always better the next day! Serves 6-8 1 Tb Oil 2 lb. chili Meat or Ground beef 4 Cloves fresh Garlic (Peel and Chop) or 1 Tb Bolner’s Fiesta Brand® Garlic in Oil 1 Medium Onion (Peel and Chop) or 2 Tb Bolner’s Fiesta Brand® Instant Chopped Onion 1-15 oz. can Tomato Sauce 1 Quart Chicken Broth 1 tsp Monosodium Glutamate (optional) 1 tsp Salt (Optional) 4 Tb Oil 6 Tb Flour 3-4 Bolner’s Fiesta Brand® Ancho Pods 1 tsp Bolner’s Fiesta Brand® Whole or Ground Comino ½ tsp Bolner’s Fiesta Brand® Ground Black Pepper Remove the stems and seeds from the chilies. Place in small pot and cover with cold water. Bring to a boil and simmer for 10 minutes. Let cool for 30 minutes. Reserve the liquid. Grind the chilies in a blender or food processor and set aside. For a sweeter flavor, using a small spoon, scrape the meat off of the chili skin and discard the skin prior to blending. Slowly brown the meat, Garlic, Onions and Comino in 1 Tb oil. Add the tomato sauce, chicken broth, the rest of the seasonings, the reserved chili pulp and the reserved chili gravy. SIMMER one hour. Heat the 4 Tb oil in a sauce pan over medium low heat. Fry the flour until it is a medium brown color. Be careful not to burn the flour. Add this roux to the chili to thicken. SIMMER over low heat for at least 1 hour. Serve in bowls with hot tortillas. Chili is always better the next day! For added heat, use a combination of New Mexico or Cascavel pods with the Ancho Chili Pods. San Antonio Enchiladas using Fiesta Brand Chili Pods Serves 6-8 3-4 Bolner’s Fiesta Brand® Ancho Chili Pods 2 cloves fresh garlic or 1.5 tsp Bolner’s Fiesta Brand® Garlic in Oil ¼ tsp Bolner’s Fiesta Brand® Whole or Ground Comino ½ cup flour 1/3cup Oil 1 quart Chicken Broth 2 tsp Bolner’s Fiesta Brand® Fajita Seasoning 2 dozen Tortillas ¾ lb. Cheddar Cheese ¾ lb. Monterrey Jack Cheese 1 Medium Onion, Chopped or 2 Tbsp. Bolner’s Fiesta Brand ® Instant Chopped Onions Cooking oil to warm tortillas. Remove the stems and seeds from the chilies. Place in small pot and cover with cold water. Bring to a boil and simmer for 10 minutes. Let cool for 30 minutes. Reserve the liquid. Grind the chilies in a blender or food processor and set aside. For a sweeter flavor, scrape the meat of the chili and discard the skin prior to blending. Heat the oil in a heavy pot over medium heat. Add the flour and cook until it starts to brown. Add the garlic and Comino and fry for 1 minute. Add the reserved chili pulp and chicken broth and simmer until sauce thickens. Heat the about ½ cup oil in a small frying pan. Using tongs, dip a tortilla in the hot oil for 15 seconds to soften it. Drain. Fill the tortilla with grated cheese, one tablespoon of sauce and roll it up. Garnish with more grated cheese, sauce and minced onion. Arrange in a baking dish or as individual servings. Heat in an oven or in a microwave until the cheese is melted. For added heat, use a combination of New Mexico or Cascavel pods with the Ancho Chili Pods. Note: If you prefer to start with dry masa, purchase six pounds of masa harina and follow package directions to make about 12 pounds of wet masa. The Day Before Cook beef and pork, covered in a 300 degree oven for about four hours. When tender, remove meat and save the drippings. Meanwhile, stem and seed the chili pods. You might want to use kitchen gloves for this step. Pull off the stem and tear open the pods down one side and rinse under running water. The seeds will wash out. Discard the seeds. Remove the chili from the skin by simmering the pods in a covered pot of water for about 15 minutes, remove from heat and cool. The pods should be a bright red color. Scrape the pulp from the skin, chop the pulp and set aside. Also, save the chili pod water. Discard the skins as they and the seeds tend to be bitter. (If you use New Mexico pods, discard the seeds, boil the pods and grind the whole pod. You cannot remove the skin.) Peel and chop the heads of garlic or use two tablespoons of chopped garlic and sauté in two tablespoons of lard. Combine and mix well: cooked meat, sautéed garlic, chili pod pulp, 4 tablespoons ground comino, 4 tablespoons salt, 2 tablespoons ground black pepper and a pinch of whole oregano. Refrigerate mixture overnight to allow the flavors to develop and permeate the meat. Bright and Early the Next Day Remove the meat from refrigerator. Put all the corn shucks in the sink or a tub and fill with warm water. They are inclined to float so you will have to weigh (push) them down into the water. Soak for two hours minimum - the longer, the better. This softens the shucks and makes them easier to use. Begin separating the corn shucks one by one until you have a large stack ready. You will want to keep the tamales off the bottom of the pot as they steam. A cushioning layer is needed. This can be a few corn shucks, overturned tea cups or aluminum foil crushed up. The tamales will cook in a steam bath. By spacing the tamales off the bottom of the pot, you can add water for steam without the tamales sitting in water. Get your pots ready. Now for the Masa In a large bowl, place 12 lb. wet masa which was prepared earlier. Gradually add 8 cups melted lard. Sprinkle with 2 tablespoons chili powder, 8 tablespoons paprika, about 6 tablespoons salt, 2 tablespoons powdered garlic, 2 cups of chili pod water, and half of the meat drippings you collected from the cooked meat. Work mixture with your hands until thoroughly mixed (an electric mixer makes this step much easier.) The main idea here is to work air into the masa until it is smooth and fluffy. It is impossible to over mix. Now Comes the Spreading Assemble helpers around the kitchen table and continue your experience. Everyone should have a flat plate or small tray and a butter knife or spatula. Take an unbroken shuck and place it on the tray in front of you, small end up, opening toward you. Using a butter knife or spatula, dip into the bowl of masa and take out approximately one heaping tablespoon of masa. Spread it on the shuck in such a way that it covers the lower two-thirds of the right four inches of the shuck. The masa should be thick enough so that you cannot see through to the shuck. Next spread some meat filling on the middle of the masa. The thickness of the masa and filling is strictly personal preference. You decide how much masa you would like around your filling. Think of other tamales you have eaten and decide what you like best. The tamale is then rolled over starting from the side with the masa and meat.The un-spread side covers the outside and holds it together. The unfilled end is then folded over to the middle. The stacking and cooking As you roll up the tamale, stand them shoulder to shoulder, open end up around the bottom of the pot you prepared earlier. After filling the pot, add 1 cup or more of water and put a tight fitting lid on; steam for about 1 hours or until the masa peels away from the shuck. The tamale tester gets to eat the first one! You may have to occasionally add water in order to keep the pot from boiling dry. Be sure to let the tamales cool for 10 -15 minutes so they become firm before eating. You will probably have to fill two pots to use all prepared ingredients. If the meat filling runs out, and you have some extra masa, bean tamales can be made simply by substituting re-fried beans for the meat before rolling. You can also fry a strip of bacon and put it inside for a bacon flavored tamale. Chicken filling can be made by boiling some chicken and seasoning it with comino, chili powder, garlic and salt to taste. The Eating Remove the shuck and enjoy the finest tamale available anywhere - right from your own kitchen. After cooling, tamales can be wrapped in foil and frozen for future enjoyment. Brisket 1. Slightly dampen Brisket and rub thoroughly on all sides with generous amount of seasoning. 2. Refrigerate Brisket overnight for full flavor development and tenderization. 3. Bake covered in oven for 6 hours at 225 degrees or barbecue over low fire 8-12 hours until tender. 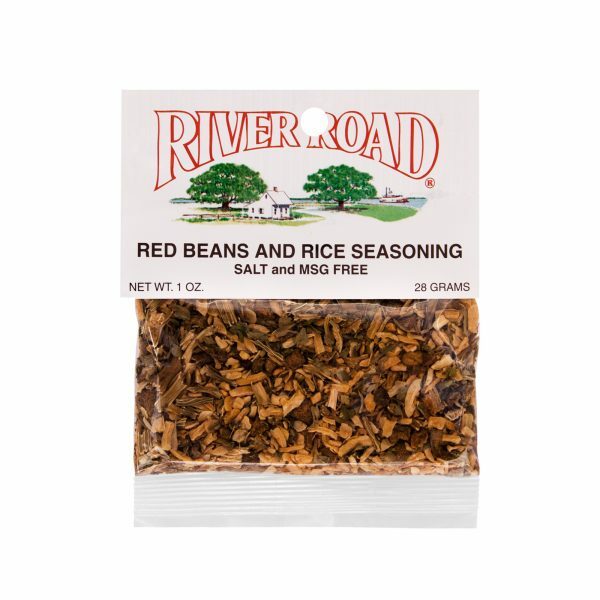 Note: This seasoning can be used on any kind of meat, poultry or fish. Melt unsalted butter or margarine and spread evenly over bread. Sprinkle Cajun Bread Topping lightly and top with grated Parmesan cheese. (Optional: sprinkle chopped chives or parsley over cheese). Heat at 325* until crisp. Also delicious on vegetables and popcorn.